As you can see, Play of the Game from yesterday was not actually the first card to allow you to co-operate with an opponent in some way – by a space of about twenty years, in fact! Peregrine Drake is an innocuous-looking card that is absolutely ridiculous, and I know I say things like that relatively often, but this might be one of the most egregious offenders. If it resolves, it effectively costs zero mana, and in fact, you’ll notice that there’s nothing in its ability that specifies it can only untap basic lands or anything else that produces only one mana. It’s unfortunate that the Drake, like its compatriots Great Whale and Palinchron, has an interesting design that does kind of boring (straightforward) things . . . but much like quite a lot of the cards that got new printings in Battlebond, it’s very lucky that Two-Headed Giant exists and is a place for them to do actual interesting things. This guy will help your teammate cast seven or eight spells in one turn, or something like Warp World on turn four, and make you feel like the Magic equivalent of Final Fantasy XIII‘s Synergists or Dungeons and Dragons’ clerics. 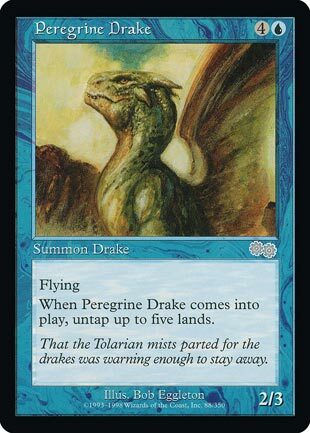 At first glance, Peregrine Drake does not look great, as a 2/3 flier for 5 mana; this is not quite to blue’s usual rate of return on flying creatures. The upshot lies in Peregrine Drake’s comes-into-play effect, the “free” mechanic from Urza’s Saga and its related sets. Spend some more mana to get it all back on resolution. Which, of course, is undeniably busted, but who cares. The worst-case scenario is that you got a free 2/3. The best-case scenario is that you end the game that turn. Peregrine Drake couples well with bounce effects and lands that generate more than one mana in one go (like Tolarian Academy, also legal alongside Peregrine Drake in Standard!). Peregrine Drake has been downshifted to common in Eternal Masters and Battlebond, and it managed to get banned out of Pauper as a result. It doesn’t do enough unfair things to be playable in Constructed, but it goes to show that swooping is, has been, and will always be bad.